No, it's not a catchy book title, it's just a reminder that the Hal Spacejock books are listed on Amazon US. So far each of the three books has an average rating of five stars, and that's without my talking friends and family into posting fake reviews - who'd have thought? This Sunday I'm doing a TV interview with Access 31 here in Perth. The program is 'on the couch' and I'm supposed to discuss publishing. Hopefully not arts, because that's something I have no experience with. Monday I'm being interviewed, photographed and suchlike by the Freo Herald. For their arts section, no doubt. Apparently I'll also be doing an interview with Grant Stone for Faster Than Light, and they put podcasts online so I'll link to that. They're also going to play the interview during the morning segment on RTR. Scoop Magazine is apparently running a review of Hal 3 in the upcoming March issue. This is a classy tourist mag which you find in hotel rooms across Western Australia, and they usually feature a lot of items of interest to the discerning tourist ... including Art. Not this time! Snerk. Scott tells me Swan magazine is going to be reviewing Hal 3. Alas, I don't know what SF has to do with the Swans. I mean, they didn't even win the Grand Final. Maybe they need cheering up. Non-Hal news - the Sun Herald and The Age both featured my share market software in their Sunday supplement last weekend. Programming is SO an art. Back to Hal news: I've been invited along to the WA society of Editors AGM to (I think) read from Hal or discuss editing or something. Either that, or I'm the Elephant Man to Janet Blagg's Treves. Then there's the appearances at the All Saints' Kids' Lit festival for my second year running. All those school kids just waiting to hear about Writing True Art, and they get me. I'll also be pootling around Swancon as usual - probably with a T-shirt decrying the sad state of Art in Western Australia. More to come - this is just off the top of my head. Copies are also available in the US from the North American distributor, ISBS, from Powell's Books, and from Amazon. The Hal 3 launch was on last night, and we're all recovering nicely. Full details here. We came, we saw, we launched. Now my focus turns to Hal 4. Michael Allen runs an entertaining blog about UK publishing called Grumpy Old Bookman, and the third item on today's post is a neat little piece about the recent Hal Spacejock and Clunk interviews. And about those interviews: feedback on both has been great, and Hal's is currently the third most popular item on the Specusphere. Clunk is not happy. So, be sure to click Clunk's and shun Hal's. Hal Spacejock Second Course has been nominated in the West Australian Young Readers Book Award. According to my publisher, this is a great indication that kids love the book. The West Australian Young Readers Book Award is a readers' choice award, organised on a statewide basis for young readers. As such, it pioneered a new concept in Australia, allowing children the major say in their prize winning literature. Dymocks would like to invite you to a Book Launch for Simon Haynes's new book “Hal Spacejock Just Desserts”, book 3 in the Hal Spacejock series. Simon Haynes is the author of three Hal Spacejock novels, a number of articles on writing and publishing, and several short stories, one of which collected an Aurealis Award in 2001. The Specusphere just interviewed Clunk as part of the 'Hey, let's talk to Hal and Clunk instead of the author' series. 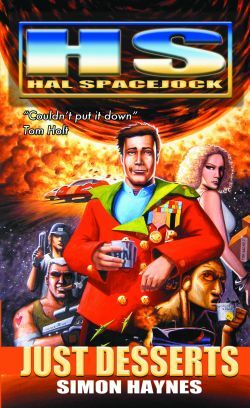 Specusphere has put the Hal Spacejock interview online, and you can enjoy Hal's thoughts on money, the future, and the nature of fictional characters right here. Last July I posted about working with my editor, in an attempt to illustrate the amount of work that goes into a book once it's picked up by a publisher. Around the same time I expanded the article for Writers' World, and yesterday I discovered the article went into issue 3 late last year.